1949 Map of Scenic and Historic Illinois - theVintageMapShop.com - the Vintage Map Shop, Inc.
By: Rand McNally & Co. 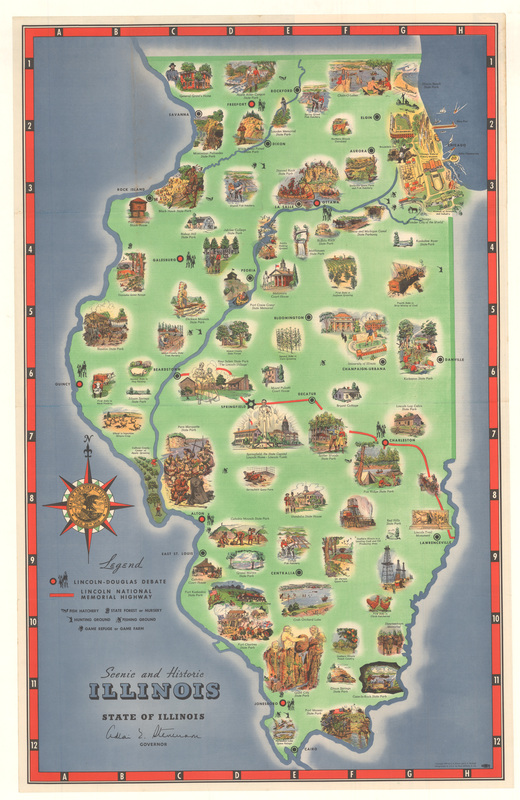 This is a bold pictorial map of the state of Illinois detailing this history, natural beauty, agricultural achievements, and outdoor activities. Special attention is paid to Abraham Lincoln as the map delineates the Lincoln National Memorial Highway, and each site of the famous Lincoln vs. Douglas debates of 1858. In Chicago, select landmarks are pictured in the style of a bird’s eye view. The seal of Illinois fills the center of a sharp compass rose.